Scott Keogh, president of Audi of America, introduces the 2018 Audi SQ5 at the 2017 Detroit auto show. Audi is joining rivals Mercedes and BMW and pulling out of the annual Detroit auto show. The German premium brand told Automotive News on Thursday that it will skip the 2019 North American International Auto Show, joining luxury rivals BMW and Mercedes-Benz on the sidelines of the January show in Detroit. 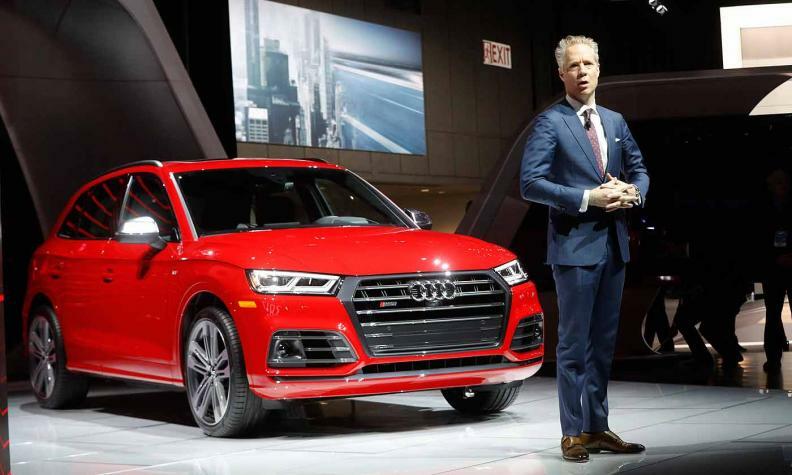 Audi, part of the Volkswagen Group, has been a mainstay of the Detroit auto show, especially as the brand's U.S. sales have grown over the past decade. It chose the Detroit show in 2017 for the global debut of the Q8 crossover concept, which is due this year. A spokesman for the Volkswagen brand said it still plans to participate in the 2019 show. Jeri Ward, a spokeswoman for Audi of America, said the brand will participate in the 2018 Los Angeles auto show. Beyond 2018, Audi will participate in major U.S. auto shows on a case-by-case and product cycle basis. Ward said Audi planned to inform its local dealers of the decision to pull out of the Detroit auto show later Thursday.